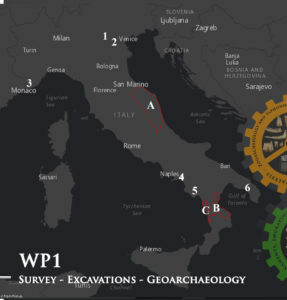 Surveys in poorly investigated areas, such as the eastern Italian belt (from Marche to Abruzzo) and the Calabria region, and excavations at key Middle to Upper Paleolithic sites across Italy will be carried out (Fig. 2): Riparo Bombrini, Grotta di Fumane, Riparo Broion, Grotta di Castelcivita, Grotta della Cala, Grotta di Uluzzo C. As excavations proceed, traditional and modern 3D methods will be used to document all evidence with particular attention to the geological nature of the Middle to Upper Paleolithic transition for detecting depositional gaps, erosional events and whether any substantial mixing occurred between layers. The sediments will be processed using water sieving and flotation. Topographic data will be processed using GIS software for analysing spatial relations of archaeological finds. Charcoals and anthropically modified bones will be selected for AMS 14C dating at labs using cutting-edge techniques. Sediment cores and cave infills will be subjected to identification of microscopic plant remains. 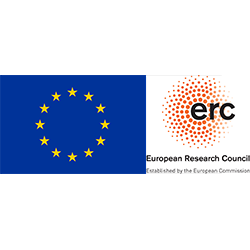 Bulk and undisturbed samples will be taken for studies on cryptotephras, on natural and anthropic formation processes using routine sedimentary, mineralogical micromorphological analyses, on paleoecology and on anthropogenic structures and fire-places.